From the moment you step aboard, you will know why Eastern Star Yacht Charters is in a class all its own. Rich mahogany, wainscoting, gleaming brass and contemporary designed-for-comfort furnishings enhance the yachts refined and unassuming luxury. 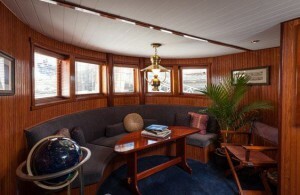 The classic 85-foot Long Island charter yacht features a spacious main salon, clusters of intimate seating, panoramic views and a wood burning stove that glows on cooler evenings. Eastern Star Yacht Charters elegant, comfortable interior offers the class and sophistication that comes from a finely-appointed yacht. 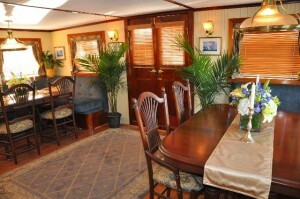 Her gracious, fully carpeted upper deck is perfect for a casual brunch or a fine dining experience. Tempt your palate with a selection from our award-winning menus, as the sun sets along the north shore. 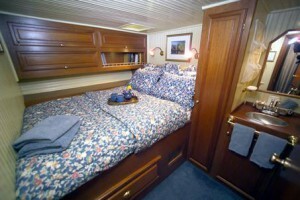 Eastern Star Yacht Charter cruises promise everything, and delivers even more! Eastern Star Library The library is the perfect spot for a masterful game of backgammon or tuck away for a private reprieve before your celebration, whether it be a LI wedding, corporate cruise or private event. You and your guests can enjoy the comfort of plush furnishings as you sip champagne and admire the scenic views of Long Island and Connecticut shorelines. The Aft Parlor An intimate space for a private conference or break-out session, the yacht’s aft area replete with solid cherry, mahogany and chenille upholstered furnishings, offers the ambiance of a New England Inn. 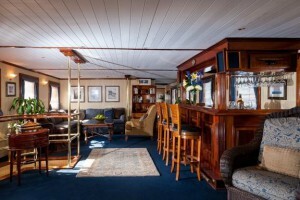 The Main Salon The classic 85′ charter yacht's interior features an elegant spacious main salon with designed for comfort seating, a mahogany bar, a cozy book filled library and a wood burning stove that glows on cooler spring and autumn evenings. Your Stateroom For brides wanting an intimate wedding-prep area to freshen up before the ceremony, the Eastern Stars’ bridal suite offers a quiet private space with mahogany vanity, full size mirror, basket of amenities, crisp linens, hair dryer and fresh towels for your comfort. Upper Dining Deck Eastern Star’s fully carpeted upper deck offers the best of both worlds by combining classic and contemporary design, a gracious dining deck with lounge areas, palm trees and ambient lighting. 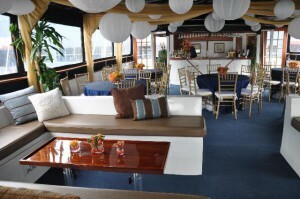 A full-service mahogany bar and state of the art sound system make this a popular place to celebrate a birthday, an anniversary, a corporate milestone or an elegant nautical wedding cruise. This versatile space can also be re-arranged for any occasion.